I feel an apology coming on… but I didn't do anything wrong. The last two weeks have been miserable. I’ve spent a lot of time trying to reclaim my artwork. Most people know better than download or print images off websites, blogs, Facebook… But some people do it knowing they’ll never get caught and others do it for personal gain. Whatever the reasons are and whether or not someone gets caught…wrong is wrong! In the last two weeks I've had 9 images stolen off my blog. And these are the ones I know about! A website stole 7 images from my blog. The website said: “Elegant Negative Paintings by Brenda Swenson”. They offered free downloads of my art. What people didn’t know is this..they would be downloading more than a free painting. They would be downloading a virus! I was horrified! After a lot of work and filing countless reports for copyright violations the 7 paintings were removed. Two weeks ago I was emailed by a so called teacher in Long Beach, CA named Moira. 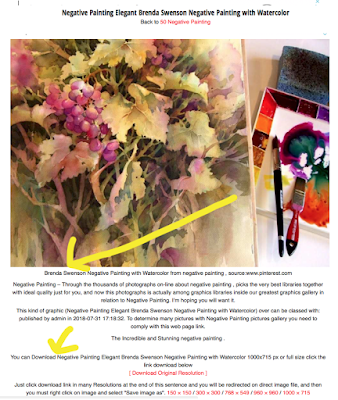 She was going to teach her students my approach to negative painting… She thought I'd be flattered she had printed my artwork to share with her students. What? I asked, why she printed my artwork? She has a copyright posted on her website. She obviously doesn’t want people taking her artwork. Why is it okay for her to download and print mine? She was pissed off that I questioned her. The conversation went downhill after that. She had never met me in person, attended a demo, a workshop, watched my DVD, read one of my books. And she was going to teach my technique? Really????? She attached a photo of her prep-demo. She was using Cadmium Red Light, Sap Green, Lamp Black, Raw Sienna and Ultramarine. She had no idea what she was doing. Why would I want her to associate my name with something that she was doing all wrong? My blog has always been a teaching tool. A way to share knowledge, experience, tools, techniques…and life experiences. It’s my connection to a bigger community of artists’, students and friends. I love the conversations I have with you and the opportunity to share the gift of creativity. Just because I shared this information “FREELY” doesn't mean anybody has the right to take it from the site! My lessons and my artwork are to remain on my blog. Not to be downloaded and/or printed. I thought having my signature on my artwork and/or having my copyright posted at the top of my blog would deter people. I was wrong…. I have never wanted to put a watermark over my artwork. (1) a watermark looked like I was paranoid and (2) I don't like the look of a watermark over art. Unfortunately this will change. No apologies necessary. Outrage is an appropriate reaction to the kidnapping of your offspring! Thank you for your vote of confidence and backing up my decision to not be quiet and to fight for my artwork. Hugs! You have every right to be upset. I'm so sorry you had to have this stress added to your life. It's not fair or right. :( Thankyou for being transparent to bring awareness to online theft. I must say, even I know that those colors would not work for a negative painting. sheeesh. Hugs! Sorry you went through that, Brenda. Many people just do not understand copyright. Watermarks are necessary for any art that needs protection on the internet. Thank you for your support. I wish I didn't have to use the watermark but those who know me and support me understand my reasons. Happy painting my friend! Thank you for freely sharing YOUR techniques, insights, beautiful journal entries, favorite pens and inks, what paints you like in your palette, cute cat stories, how to make a Bev Bag, what supplies you like and places to buy them, how to do negative painting, and sadly how to cope with situations like this...at least she didn't submit YOUR art as her own like the student did with your blue truck as cover art on the catalog! This is so wrong on so many levels. People understand taking a painting off the wall and leaving without paying is theft. Why don't they get that a blog is a "wall" and taking stuff from it to make a profit without benefit to the blogger, is theft as well. They are THIEVES! 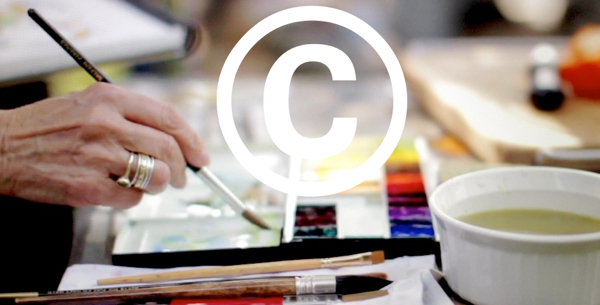 You definitely need to protect your artwork with watermarks and copyrights. Sadly, that's necessary to help stop people from stealing from you. Thank you for your willingness to share your hard-earned expertise with all of us. Sorry I have to sign anonymous, but the other option was my email address, which I didn't want published publicly. I can tell you're a loyal follower. Thank you for joining me on this journey and supporting me with your encouraging words. It's all about sharing our art, our life experience and the joy of creating. Hugs! My friend sent me your post and I just had to respond with sympathy. I know a lot of people are teaching my techniques and charging students a workshop fee. Mostly, I know this when I get a lot of individual book sales from one city from different people. Even though my book is copyrighted and my method trademarked, there is no ay we can monitor everything to protect our rights. Most of us are just individuals and not corporations! But I admire you for fighting -- especially as the download included a virus! No matter what we do, there will always be people who can't create on their own and need to steal other artist's ideas, images and techniques. My attitude is "what comes around, goes around" so eventually, this will catch up with them and their lives will be diminished because of their actions. Yeah the virus was a whole new level of mean-spirited people out here! I am so sorry you are having to deal with this --there is a lot of ignorance out there. I'm glad you spoke up and hope using watermarks helps. Thank you for your words of support. Hugs! I had an issue a number of years ago. It was not quite like what you described in your post; but, it did bother me at the time. A member of a group that I moderated told me after the fact that she had downloaded a copy of a painting that I had done and was using it as her desktop pattern. The thing that bothered me is that she did not ask me first before she downloaded it. If she had, it might not have bothered me and I would have given her the permission to use it on her desktop. Seriously?! It's amazing what people do that they think is flattering to us when intern is the kick in the stomach. People are clueless about ethics in the art world. I wassurprised to find an app to remove watermarks! If there is money to be made somebody will come up with a way to do it. We are living in odd times. oh my goodness, your art is beautiful and you have every right to protect your property from theft! i never liked adding a watermark to my cards until i learned my designs were being copied and passed off as others' work. also, people were downloading my designs. i was lambasted by commenters saying i shouldn't post to the internet since that's what is there for - free for the taking. now i feel like my watermark sends a more obvious warning than my copyright blurb and page. I agree with you totally, Brenda, and I'm sorry this has happened to you yet again. It amazes me that people blatantly take the work of other artists without permission and often claim it as their own work or design. That teacher was way out of line and should have known about Copyright issues. A lot of people on Social media, such as Facebook and Pinterest, have this mind-set where they see everything as fair game for them to take and use — wrongly so. I was once abused by a Facebook Page owner and their Followers for diplomatically pointing out that the images they were using was actually in breach of the Photographers' copyright. The Page Owner had been angry and defiant that a Photographer had dared to demand that their images be removed from the page. Sadly, I don't think there is any proven way to fully protect our work 100% online because even watermarks can be erased via a photo-editor. However, a watermark will hopefully serve as a deterrent — in that it's a visual reminder that the work is copyrighted and they may consider it too much hassle to remove. All the best and I hope this doesn't happen again to you. In addition — I had a student once tell me that she was planning to enter a piece of art into an art competition. The piece of art was MY own design which I had taught her in class, the whole way through the painting process. She clearly didn't see anything wrong in what she was doing despite the rules of the competition clearly stating that the work must be entirely their own design and also not to have been done in a classroom setting. I was stunned! Most Internet thieves are lazy. A watermark won't stop anybody but it will deter enough people. I am positive I'll face the situation again but today I am glad to have a small victory. You have every right to be furious... these people came into your house (blog) and ransacked it and STOLE from you. It's enough to make you want to stop sharing at all. You took the words right out of my mouth. I felt as if I'd been robbed. It's not enough to make me stop sharing. Too many good people are out there that make it worthwhile. It's for them and you that I continue to share. Otherwise the real jackass out there wins. So sorry Brenda that you are going through this.... I hope you get this resolved and that people will realize that is your work and that you are very gracious in sharing what you do!!! I know am very grateful!!!!! Oh my! How horrible this experience must have been. Another artist who I follow had someone visit her studio for 2 hours, served her refreshments and shared ideas, artist to artist, only to find that the woman visitor copied her techniques and images and called them her own original work. I guess there's no end to what people will do to make a buck. Brenda, I've been there, had Intellectual Property stolen off my professional website, and used by another person or business for their own remuneration. There is no need to apologize, theft of Intellectual Property is theft as much as stealing somebody's car or television is theft. Anybody who still does not understand this, is willfully ignorant or just plain criminal. You do not have to explain yourself. Protect your property. I support this 100%. Additionally, anybody who has stolen your property, and wants to fight you on whether they are entitled to keep it? Contact their ISP who hosts their website. There is almost always a form or 1-800-number to contact them regarding IP theft. The pages (or sometimes the entire site) will be deleted, often within 24 hours. Yes, it is exhausting. Being required to prove that you are the copyright owner is sometimes a challenge. Pro-tip, (apologies if you know this info, but hopefully it also helps others,) always keep the original full-res image files on a storage drive. Make sure you've used the meta-data function in your editing or processing software, with your business name, and a contact number or email. Some programs also allow you to add location data, and certainly date and copyright. Then do not touch this file, this is your master processed file. When you post that image to your website, reduce the size to whatever web size you prefer to use online, and RENAME THE IMAGE, even if it's just an extra identifier, such as the long-edge pixel size like prettyflower840.jpg. If you put up a downloadable image, make sure this is also a resized image, and name it with the image size prettyflower1920.jpg. This makes it MUCH easier to prove to an ISP that you are the copyright owner, even if the thief has erased the metadata. You can do this with your web copy too, save an original text/doc/rtf or whatever format copy, and DO NOT TOUCH IT. If you make text revisions, save a NEW copy. That way you have a dated trail of when it was written. I'm sorry you have experienced this, Brenda. I have always enjoyed and learned from your blog posts. Sadly, I think it is impossible to control theft of art, or anything else, on the internet. You simply cannot expect people to respect ownership or privacy in the digital era. This is a terrible, but true, commentary on the world we are living in. Under these circumstances it may be better to limit what is shared, take reasonable precautions like watermarks, and then to expect the inevitable. I hate to see you suffering so much over something you really cannot control. Is marked Copyright, but even this won’t deter the inexperienced from using information which as you know is built up over decades. Soldier on. Greetings from Oz. Thank you for your words... You know what it's like. There are plenty of dead artists that it's okay to copy, don't they know that? You are absolutely right to be outraged at someone stealing from you. I license prints and carefully control numbers and quantity, as you do. It is stealing actual money from you to offer free prints. Unfortunately, the latest Adobe software makes watermarks very easy to remove. There is really no recourse artists have if we want to show our work. Thank you for your words... Your rights. watermarks is like a locked door on a house. If someone wants in they find a way to pick the lock. The only way I’be found is to change the size for the web to small. If someone tries to enlarge it for any reason it just pixelates and blurs. Watermarks are only a slight deterant. I feel the internet is like your books. Once its out there its very hard to control. People are sometimes innocent and ignorant but many are just thieves and will figure a way to do what they do! Good Luck Girl. I feel lucky your on the web to inspire me!! The people I inspire...which is YOU, is this reason I continue to share. Your rights. Watermarks is like a locked door on a house. If someone wants in they find a way to pick the lock. What has happened to you is so wrong, so heartbreaking. Take whatever steps you need to take to protect yourself and call down those who shamelessly steal. Emmanuelle, Thank you for your thoughtful and encouraging words. It warms my heart to know I have fellow artists and friends who support and cheer me on! As a long term blogger (over 250 book reviews), and many paintings, I learned that to put it on the Internet is to give it away. Watermarks make little difference and are easily overcome with Photoshop. May I suggest that you post only small images on your blog and website. At the moment when I click on your paintings I see a huge image come up on my screen. I suggest you restrict your images to no more than the width of your blog (say 600 pixels along the top edge). This will greatly restrice the usability of downloaded images and yet will not make your blog any less attractive. Thanks for your input.... happy sketching! It infuriates me that this happened to you. I am only in my first year of watercolour and have been both grateful and dependent on the generosity of artists like you who share on line. I am a retired photographer and made my living doing travel and landscape photography as well as taking people on photography tours both here in Canada and abroad. I was often robbed, and with the skills the internet provides I've seen my work show up in International publications under the names of others. 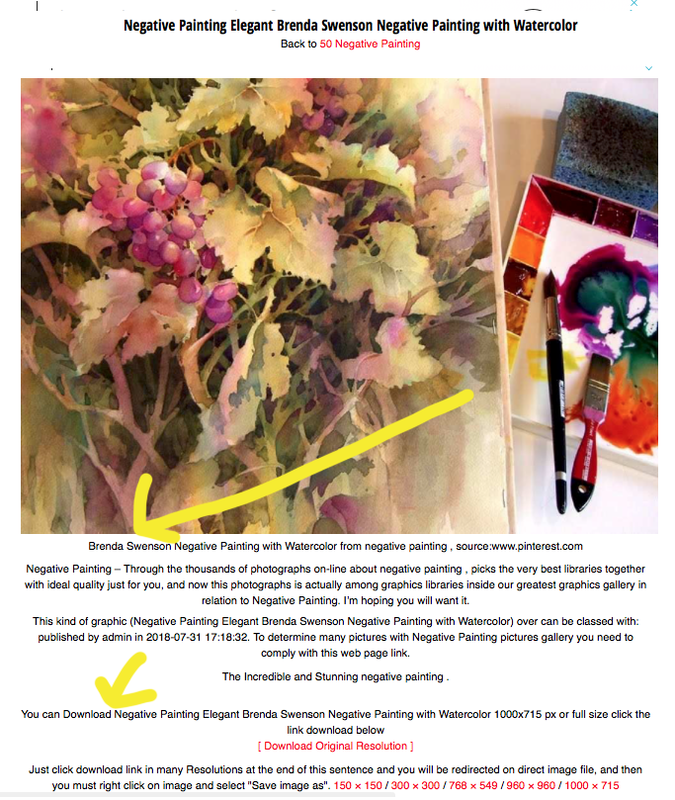 What has saddened me is the experience I've had with artists who believe that since it's "just a photograph" they are free to copy detail for detail, sell, exhibit and publish my work as their own. There is that old saying, "Steal like an artist". I recently began my own YouTube channel to track my journey as a beginner in watercolour and sadly discovered that a women from a blog was canabalizing my videos by taking a freeze frame, putting in elements from other paintings I'd shared on the video, including a full- sized picture of me painting. She thought I would appreciate it, yet gave me no credit and signed it. I'm only saying all of that to let you know that you are far from alone in this world of greed and frankly abuse. You have every right to be livid since you have been abused by these people. Please don't stop sharing on your blog. I'm sure I'm not alone in saying that you have been a blessing to me as I learn this new and thrilling form of creative expression. It’s because if people like you who appreciate, admire and understand how important knowledge is that I’ll continue. Thanks for your words of understanding. Whenever I refer to your work, I give people your website/blog information so they can go and see it as you have presented it or I refer them to your books. There are so many people out there that are clueless about "artistic property". I am sorry you have had to spend time away from your art to defend your property! Grrrr. WE all love your blog teaching and pray that this is a temporary glitch and can be remedied. Ginny, Thank you for you friendship and support. I wish it was an isolated event but I have a feeling it’s going to be a growing problem. I’m grateful for friends like you who support me in protecting my work. I also hope friends will let me know when they see something on the internet that belongs to me so I can correct the problem. I am so sorry to hear this has happened to you but it doesn't surprise me. One of my art teachers, Joanne Sharpe, had the really nasty experience of seeing a garden flag, which was her artwork with a printed word in another font instead of her handwriting, for sale in Walmart, made in China! And no, she didn't receive a dime nor acknowledgement that it was her artwork. I understand this happens to a lot of people. In fact, it has been one of the reasons that art teachers don't like giving handouts because people who are not teachers, steal the handout to use to "teach" a class that isn't their work. You have been so generous, I wish there was a way to stop the stealing of art and teaching methods. Kate, Thank you for your understanding words. It’s a growing problem and I don’t see a solution besides being diligent. It’s sad how people feel free to take and profit off of other people‘s hard earned skills and devotion to their craft. I can believe the balls of some people. Yes, some theft is done out of woeful ignorance, but to purposefully take your original idea, without crediting you, is vile. Please know that you have the admiration & support of all of your many, many devoted followers. Melissa, Thanks for your comment and support. Looking forward to meeting you next spring! oops - meant to say "I canNOT believe the balls of some people". Just so you don't feel alone... I discovered copyright infringement again this week, too, and in my case it was the gift shop in a major national landmark selling thousands of the reproduced image. It is just WRONG, it is theft. And yet I have almost endless new projects planned, new art to make, and like you I'm an artist and they are only people who steal art. They can't make it. Lucky us with an endless supply of art supplies and ideas. All that to say, you are not alone. I understand your righteous anger and I hope that like me you are already joyfully at work on more new art. Because art is our defiance against theft and so much else that's going wrong in our world at the moment. Sharyn, Gift shop at a national landmark!!!! Dang! Is their no moral in these folks. I’m sorry to know you’ve been battling this too. It’s a huge waste of our time and energy. All we can do is get back to work and make more art... because that’s who we are. Thank you for continuing to share your art and tips in spite of the clueless and downright evil things others do! Thank you for fighting back, and for keeping your true friends and students informed. We appreciate you so much dear Brenda. Hope the cheaters and crooks reap what they sow asap. No apologies necessary. You are in the right. Thank you for your words of encouragement and support. Because of people like you that I continue to share who I am and what I do. In the end we reap what we sow... I’ve got to keep my head up and move forward. Let others deal with the errors of their ways and not let their actions become my anger and burdens.